Gita asked if the word for boots - מגפיים magafayim is related to the word for plague - מגפה magefa. Well, Gita, they aren't related. As you noted, magefa comes from the root נגף, meaning "to strike, smite." Magaf מגף (the singular of magafayim) originally meant an armored legging worn by soldiers, and in Modern Hebrew came to mean "boot". Klein says that he's unsure of the origin of the word - it perhaps came from either the root גוף (=to close, shut), or the related root גפף (= to enclose, cling, embrace). 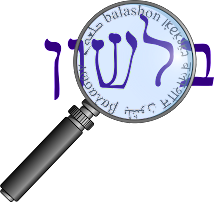 These roots do not appear to be related to the word guf גוף - "body" or gaf גף - "back" (the rear part of the human torso). They come from the word gav גב - also meaning back. The Arabic word here looked familiar, and in fact, it is also the origin of the Hebrew word for "sock" - גרב gereb. In his entry for gereb, Klein writes that it is borrowed from the Arabic jawrab (=socks, stocking). Now who did the borrowing? None other than Eliezer Ben Yehuda, who first used the term in an advertisement in his newspaper HaZvi in 1885. Ben Yehuda commonly used Arabic terms when no Hebrew one was available (although in his dictionary he also quotes the Aramaic word gorba גורבא - a garment for the leg, mentioned in the Halachot Gedolot and Aruch). The origin of the Arabic term is debatable. Some, like Stahl, say that it comes from Persian jorab. Others say that Persian actually borrowed from Arabic as well. In the book Rega Shel Ivrit, Anat Shpitzan writes that we find in the Mishna (Terumot 10:8) the word garab meaning "bottle" or "jar" to hold wine or oil, but also referred to a leather sack used to hold clothes or other items (see Ibn Janach here). From here, apparently, the Arabic word for sock developed, for in Literary Arabic the word also means sack or bag. The mishna in Terumot vocalized the word as garab (which is how Ben Yehuda also vocalizes it), but since the plural was garbayim, and socks are frequently found in pairs (but not always!) it was easy to assume that the singular was gereb, based on similar singular/plural matches as ערב/ערביים - erev/ arbayim. The last question remaining about garbayim is - are they masculine or feminine? While today's dictionaries say that it is masculine, there was some debate a few decades ago. Avineri in Yad Halashon (page 99) has an interesting entry, based on articles he wrote from 1946-1950. He disagrees with Ben Yehuda's spelling of garab and garbayim, for if the singular is garab, the plural should be gerabayim (like כנף/כנפיים). According to Avineri, Ben Yehuda knew that people said garbayim in the plural. He therefore says we should recognize gereb as a new word (not based on the garab) of the mishna, and since it comes from the Aramaic, we can use the pattern of berez ברז coming from birza ברזא and selek סלק coming from silka סלקא. Once he established that the singular should be gereb, Avineri (after some discussion) concludes that the word should actually be considered feminine, in the same way similar vocalized words are: even אבן, eretz ארץ, beten בטן, etc. Two other reasons he gives for this conclusion are that the word for shoe - naal נעל is feminine (and it would be easier to have both words of the same gender) and that almost everyone both writes and says gereb in the feminine. "Since the usage has both a grammatical and a psychological reason - it should not be forbidden," he writes. For Chanukah, all the parents in my son's gan were asked to send "garbayim lebanot". My husband and I read the note he brought home and quickly realized that we didn't need to do anything - only the girls needed to bring a pair of socks. The next day at the gan I was reprimanded for not sending socks with my son to gan - Oh, I quickly realized, all the kids needed to bring in a pair of girl's socks. So I sent my son to gan with a pair of pretty pink socks with lace around the top. When I picked him up the next day, I was again reprimanded - "the socks have to be white so they glow in the dark - why did you send pink?" "Oh garbayim LEVANOT" How was I supposed to know? I told the story to a friend of mine who is an ulpan teacher, whose son is in the same gan and she said that it was a natural mistake - socks are masculine so they should have asked me to send "garbayim levanim". I'm not sure that this would necessarily have helped me - I would probably have sent a pair of blue tube socks the first day.